Scientists are not the most social people on the planet. Many of them would rather be holed up in their labs trying to make the next big discovery than hanging out on Facebook throwing virtual pies at each other (although there are exceptions). But what if they could organize their all their scientific papers online and share them easily with other members of their lab? Mark Kaganovich figures that will get them online. After graduating from Harvard with undergraduate degrees in biochemistry and computer science two years ago, he set out to create Labmeeting. In May, 2008 he closed a $500,000 seed round from Peter Thiel, Kinsey Hills, and other angel investors. And since last week, Labmeeting has been open to anyone with a college e-mail account. Typically, scientists have stacks of papers, protocols, and notes in their offices that they pass around as PDFs. Labmeeting is designed first and foremost as a document management site that allows scientists and students to easily upload all of those PDFs, organize them, search them, and share them. 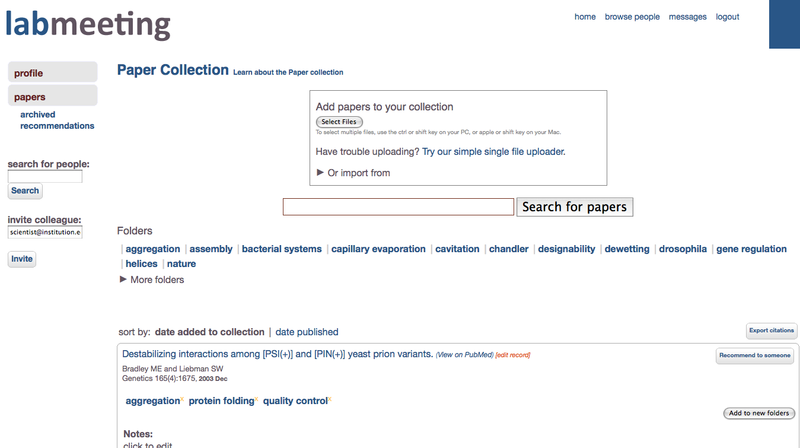 Scientsist can create groups, and invite other members of their labs to create a common repository of papers that can be accessed from anywhere. 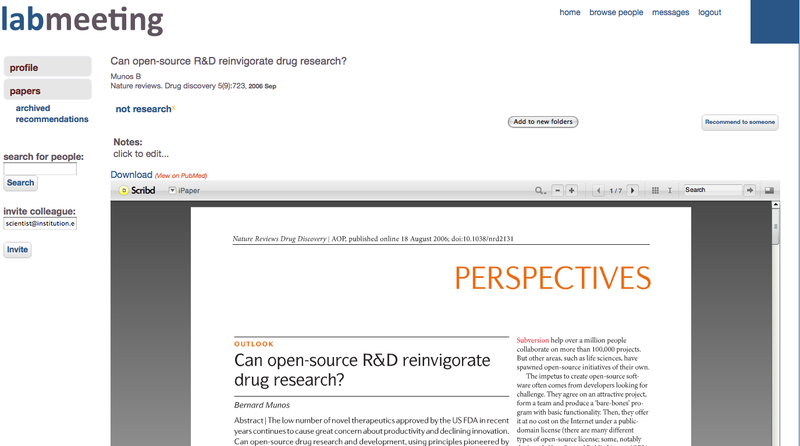 The PDFs appear inside an embedded Scribd window (Kinsey Hills is also an investor in Scribd) . What we are trying to do is change the way information in biomedical research and the medical community is distributed and retrieved. Scientists can recommend papers to colleagues, mark them up, create collections, and follow what other scientists are collecting. Each scientist gets a profile page. By interacting through their research, they are more likely to interact with each other. Labmeeting could also form of basis a community ranking system for scientific papers, based on who is reading, writing, and sharing them. Labmeeting is free for individual scientists and students. Eventually, Kaganovich plans to charge subscription fees to corporate users such as drug and biotech companies.